I am calling a bit of an audible today. Instead of concentrating on the lessons for the Sixth Sunday of Easter, we are going to talk about the Ascension of Jesus, which is officially observed on Thursday. To do this, we are going to go back to some stuff from the Reformation. Luther is on my mind since Christopher and I are just a couple of weeks from going to Germany ourselves, thanks to that great Christmas present we got from someone here a year and a half ago. For forty days after the resurrection, the risen Lord Jesus met with His disciples—that is, the eleven remaining apostles and those who were gathered together with them—in order to bring unity to the infant New Testament church. He speaks His peace upon them. He displays His pierced hands and feet, allowing them to touch Him and see He is really present and not a spirit, not a ghost. He eats a piece of broiled fish while standing there with them. And He teaches them, showing how everything in the Scriptures, in Moses and the Prophets and the Psalms, was written of Him and His fulfillment of them in His death and resurrection. You may also recall that when Jesus first appeared to Mary Magdalene, He told her that He must ascend to the Father (Jn 20:17). And so that’s what He does at the end of the Gospel: “Then he led [the disciples] out as far as Bethany, and lifting up his hands he blessed them. While he blessed them, he parted from them and was carried up into heaven” (vv 50–51). But now, doesn’t that mean that Jesus is far away? In our First Reading, Acts 1, it says the disciples stood gazing up into heaven as they saw Jesus go. We can picture them straining to see Him, wanting to see Him, wondering what they’re going to do now that they can’t see Him. Aren’t the disciples being left alone, at least until Jesus comes back at the end of the world? Aren’t we being left alone now that Jesus has become this distant God, way far away up there in heaven? That’s what a lot of people think. Don’t we have plenty of times we wish Jesus wasn’t so far away? Have you ever thought Jesus has left you alone? Have you ever felt alone when you were sick? Dealing with a crisis in your family? When things just haven’t been going your way for a while? Well, that’s what our reason, our understanding, tells us. If we can’t see Jesus, He must be far away, a God who isn’t here for us when we need Him. Going back to Luther and Zwingli for a moment. Zwingli saw the ascension as Christ’s escape from the earth to be seated at the Father’s right hand—God’s right hand being a place at the edge of the created universe. For Zwingli, Jesus went far away and He’ll come back only on the Last Day. On the other hand, Luther trusted in Jesus Christ’s words, “And behold, I am with you always, to the end of the age” (Mt 28:20). Luther understood that Jesus has established a new way in which He visits His people and helps them. During the course of the Marburg debate, Luther came to realize that Zwingli was of a different spirit than the Holy Spirit. The Scriptures can only be spiritually understood, and this is something that only God can do for us. Zwingli rejected this working of the Holy Spirit and leaned on his own understanding, his own wisdom. Luther received the proper understanding, blessed by God to have his “mind and heart [opened] to understand the Scriptures and to listen to the Word” (FC SD II 26). Listen to the Word and have your minds and hearts opened by the Holy Spirit to understand the Scriptures today. Jesus doesn’t abandon us in His ascension. Rather, He continues to be truly present with His people by new means. He’s still with us, for Christ Is Truly Present in His Gifts, what the Church calls the Means of Grace. 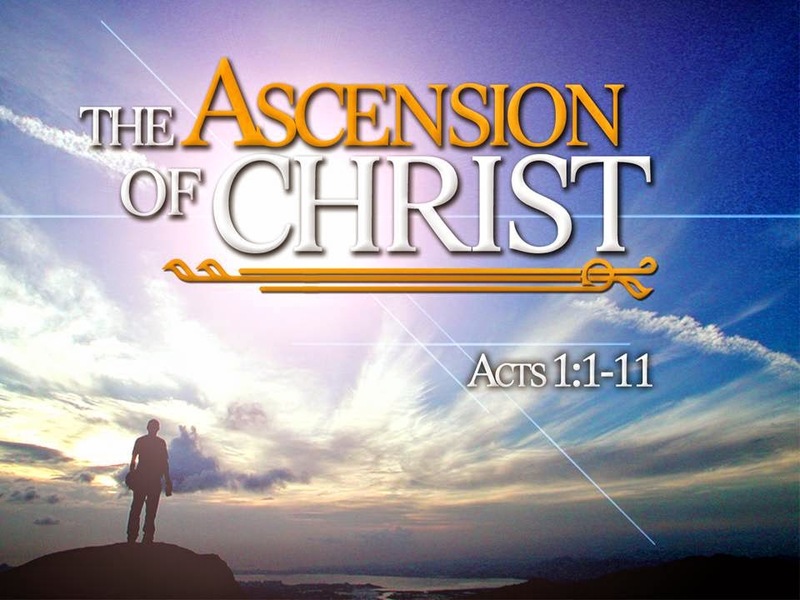 By His ascension, Jesus is put “far above all rule and authority and power and dominion” and is “head over all things to the church” (Eph 1:21–22). Jesus Christ sits on His holy throne as a great King over all the earth (Psalm 47), and from His throne, distributes His gifts to His people. These gifts are no mere symbols or simple remembrances of what He’s accomplished on our behalf. Rather, they are the means by which Christ gives Himself, His Word, and His work to us. Faith and forgiveness of sins is accomplished through these Means of Grace. For those of us who were baptized as infants, in that baptism, we received faith, forgiveness and eternal life. If we came to faith later in life, the Holy Spirit used the Gospel and the preaching of the Gospel: “that the Christ should suffer and on the third day rise from the dead.” The Gospel creates faith where there is none and strengthens the believer. The cross is placed upon us in Holy Absolution, so that repentant hearts receive forgiveness. Christ feeds us His very body and blood, given to us Christians to eat and to drink for the forgiveness of our sins, in the Sacrament of the Altar. Jesus hasn’t gone off somewhere, like the apocalypse planet Nibiru (April 23). If you are sick, Jesus is still with you. If you are facing a crisis, Jesus is still with you. If things aren’t going your way, Jesus is still with you. If your life is fantastic, Jesus is still with you! Jesus is with us when He is preached, when His Word is declared, when sins are forgiven in His Name, when we are baptized in His Name, and when we receive His meal here. Jesus is present with His faithful people. Jesus has not left us. He is with us. Before Jesus went that way and the disciples could no longer see Him, before He was carried up into heaven, He raised His hands in blessing. His hands remain lifted to bless us, to bless our witness and worship. Just as He blessed Luther, granting Him a bold confession at Marburg in His day, Jesus Christ, through the Work of the Holy Spirit, opens our minds to understand and our hearts to believe He is truly present with us today. Therefore, please, please remember that when things aren’t going your way, when you feel alone, you are not. Jesus is not gone. He is here. Adapted from Concordia Pulpit Resources, Vol. 29, Part 2.